Nowadays listening to music on your iPhone (or even your iPad) needn't involve Apple's own Music app. Music streaming is big and means that you don't always have to buy music from the iTunes store. Here are the best apps to listen to music to you smartphone. A list of music apps for the Phone would not be complete without mentioning Spotify. While a paid-for account unlocks everything this app has to offer, subscribers to the free account still get quite a lot of goodies. The user interface has been continuously tweaked to make searching for and listening to music easier and better. There is also CarPlay support so you can safely use the app while driving. You save entire albums, artists, or playlists so you can find it later while the in-app equaliser lets you adjust the playback of songs. This music discovery app helps you identify songs playing anywhere. 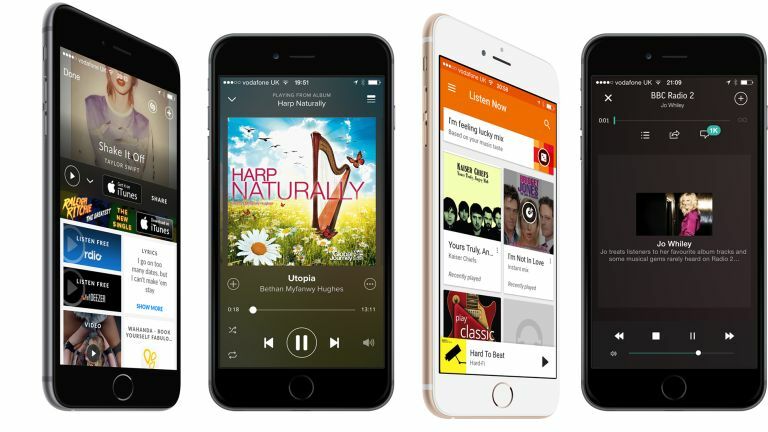 Just point you iPhone at the music source, be it on the radio, TV or even at the pub and the app will tell you the song and artist as well as any other data about the track and a link to download it from iTunes. The app doesn't have to be online when the music is playing, just record and the app will find the music next time you are connected. It also works with Apple Watch, just tap on the icon on the device and the Watch displays the song, artist and lyrics. This streaming app gives you access to all the latest music; just search for an artist or track to find music as well as trending hashtags and genres that allow you to discover new music. There's around 20 million plus songs to choose from as well as six million radio stations in all the genres you could imagine. If you have an iTunes Music library that is bigger than the space you have left on your iPhone, then Google Play Music could come in handy. You upload all your track from iTunes (most of the time it matches song titles and artists against its database and uses what it has already) and stream them back through the app without taking up valuable space on your device. It also sports a subscription service called “All Access” that boasts a library of more than 30 million songs. It also has a playlist feature and YouTube Music Key that shows millions of music videos as well. This app allows you to listen to music from radio stations the world over. The intuitive interface makes finding stations a breeze. There are over 100,000 stations to choose from covering just about every genre imaginable. In addition to music, listeners can choose talk radio and news channels.